DNS-based Service discovery is a process in which a client uses the DNS protocol to locate servers in a network that offer a specific service such as LDAP or Kerberos. One typical type of operation is to allow clients to locate authentication servers within the closest network infrastructure, because they provide a higher throughput and lower network latency, lowering overall costs. No need for clients to be explicitly configured with names of nearby servers. DNS servers are used as central providers of policy. Clients using the same DNS server have access to the same policy about service providers and their preferred order. 0 (priority): Priority of the target host. A lower value is preferred. 100 (weight). Specifies a relative weight for entries with the same priority. For further information, see RFC 2782, section 3. 88 (port number): Port number of the service. Canonical name of the host providing the service. In the previous example, the two host names returned have the same priority and weight. In this case, the client uses a random entry from the result list. The IdM DNS server automatically returns a DNS alias (CNAME) pointing to a DNS location specific SRV record which prefers local servers. This CNAME record is shown in the first line of the output. In the previous example, the host idmserver-01.idm.example.com has the lowest priority value and is therefore preferred. The idmserver-02.idm.example.com has a higher priority and thus is used only as backup for cases when the preferred host is unavailable. 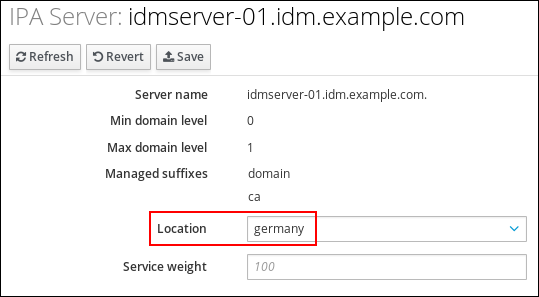 For IdM DNS servers that are authoritative to the primary IdM DNS domain, IdM can generate location-specific SRV records. Because each IdM DNS server generates location-specific SRV records, you have to install at least one IdM DNS server in each DNS location. The client's affinity to a DNS location is only defined by the DNS records received by the client. For this reason, you can combine IdM DNS servers with non-IdM DNS slave servers and recursors if the clients doing DNS service discovery resolve location-specific records from IdM DNS servers. In the majority of deployments with mixed IdM and non-IdM DNS services, DNS recursors select the closest IdM DNS server automatically using round-trip time metrics. Typically, this ensures that clients using non-IdM DNS servers are getting records for the nearest DNS location and thus use the optimal set of IdM servers. Clients can cache DNS resource records for an amount of time that is set in the zone's configuration. Because of this caching, a client might not be able to receive the changes until the time to live (TTL) value is expired. The default TTL value in IdM is 1 day. If your client computers roam between sites, you should adapt the TTL value for your IdM DNS zone. Set the value to a lower value than the time clients need to roam between sites. This ensures that cached DNS entries on the client expire before they reconnect to another site and thus query the DNS server to refresh location-specific SRV records. For further information how to modify the default TTL of a DNS zone, see Section 33.4.2, “Adding Additional Configuration for Master DNS Zones”. Open the IPA Server tab, and select Topology subtab. Click IPA Locations in the navigation bar. Click Add at the top of the locations list. Fill in the location name. Click the Add button to save the location. Repeat the steps for further locations to add. Repeat the step for all locations to add. Click IPA Servers in the navigation. Click on the IdM server name. Repeat the steps for further IdM servers you want to assign a DNS location to. idmserver-01.idm.example.com to apply configuration changes.